Smartworks has a footprint of more than 2 million sq ft across 20 locations in nine cities. Hyderabad: Smartworks, a workspaces provider, launched its flagship facility in Bengaluru. Spread over 3 lakh sq ft, with 6,000 seats, this is the firm’s largest centre located in Global Technology Park (GTP), Bellandur. One of the key highlights of the flagship centre is the introduction of ‘Smart Mitri’, the world’s first AI enabled she-robot. Smart Mitri will be Smartworks’ in-house productivity mascot and will play an influential role in handling the overall office management for the facility, ranging from the visitor system to being a counsellor eventually. This is a first time in the world that a co-working firm is introducing robotic technology to the co-working management eco-system. Smartworks has a footprint of more than 2 million sq ft across 20 locations in nine cities (Delhi NCR, Kolkata, Bengaluru, Mumbai, Hyderabad, Chennai and Pune) catering to more than 500 organisations across large enterprises, SMEs and start-ups. 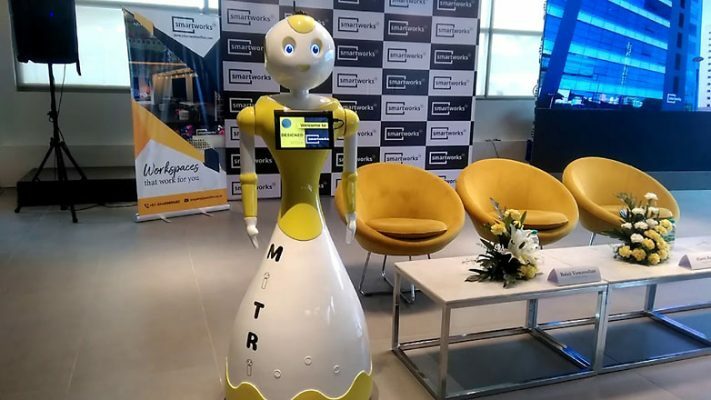 Present at the launch of the Smartworks Bengaluru facility was Balaji Viswanathan, CEO of Invento Robotics, a Bengaluru based startup and the brainchild behind Smart Mitri.